Every angler visits a piece of water for the first time. These are my impressions as a first timer to the Bighorn. I imply no level expertise. It's a bit of a haul for a day trip, but doable for the young and the tough. I left Bozeman around 4:30 a.m. and met up with Satoshi in Livingston. He was the young and tough part of the venture. For Satoshi, it was a guides day off. Of course he ended up rowing the boat. As I'd lamented in recent posts, spring has been slow to appear in Montana. It was equally slow in appearing as we headed east. Patches of snow still lay in gullies as we drove through the Crow Reservation. Frozen fields were covered with sheets of water from the slowly melting snow. It was raining when we arrived at Ft. Smith. In no hurry to launch, we took our time, visited a couple of the fly shops, decided on a float strategy, and arranged for a shuttle. 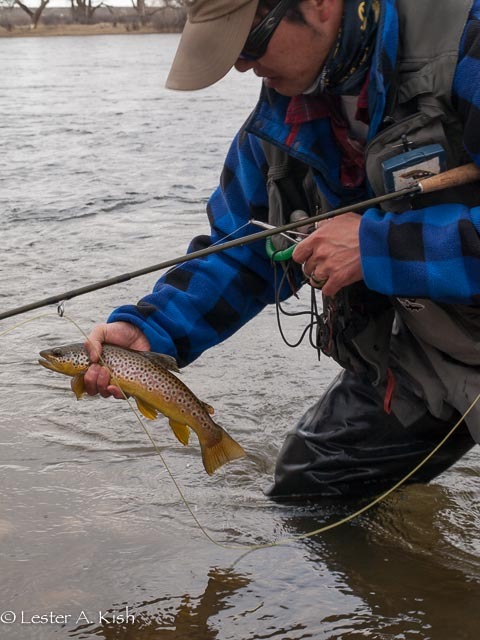 No secret, the Bighorn is a known quantity among the western fly fishing crowd. Folks either fish while floating or pull out and wade fish. 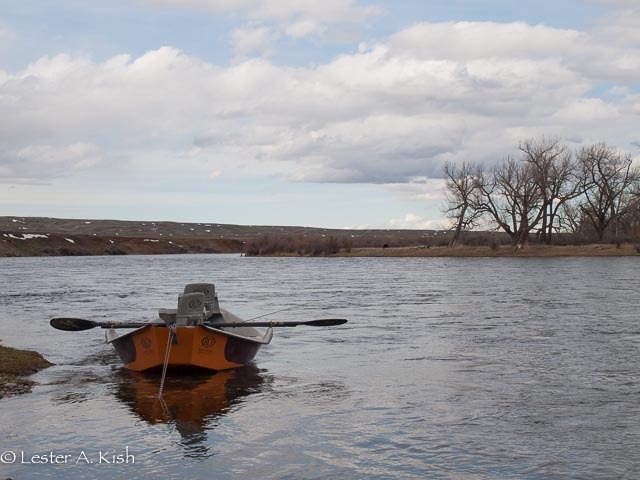 With limited river access, a boat comes in handy. 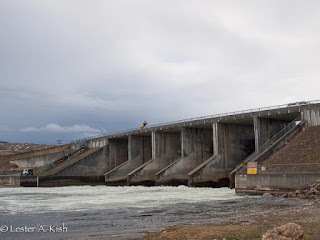 The river ran at 7500 c.f.s and was clear and cold at the Afterbay dam. I thought that it was too fast and too high to fish. Initially I thought "holy crap", how do the fish eat? As a spring creek fisher, it took a while to get reacquainted with the nymphing game. Rigging was simple. Presentation consisted of lobbing a terminal rig which consisted of an indicator, 9' leader, tippet ring, section of 4X, top fly, some 5X and a dropper fly. Short fast drifts were the order of the day. It's cast, mend, follow the drift, repeat. Line handling skills are useful, and thankfully do improve with practice as the day progresses. I'll admit that it's a workout. 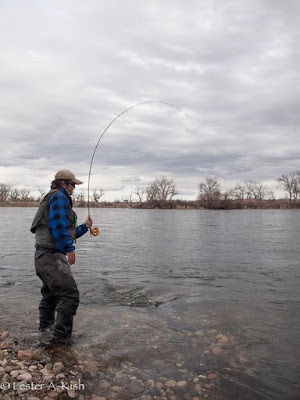 By afternoon I was starting to get the hang of it, although I must admit that I prefer casting a three weight with a long leader, tapered to 6X, tipped with a size twenty or twenty-two fly. I was most impressed by the scrappiness of the fish. They pulled hard and used the current to their full advantage. 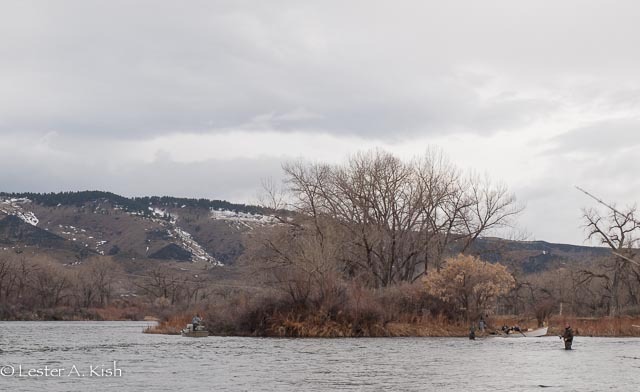 Primarily a brown trout fishery, the Bighorn fish were highly colored, reminiscent of autumn. A word about Satoshi. He's organized, knowledgeable and a student of fly fishing. He takes pride his equipment, which is clean and maintained impeccably. He's also a prolific fly tier. Late in the day I chided him about his fly inventory, as in enormous. 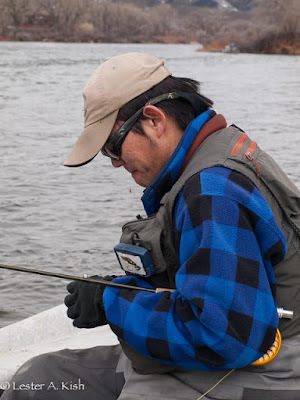 Anyone looking for a pleasant day on the water would do well to seek him out (Satoshi's website). The wind had blown on and off throughout the day. Late in the afternoon it subsided. Fittingly, there was time for one more stop before heading to the take out. Satoshi spied fish rising. They were tight against the shore, sipping midges. He went to work and promptly took a half dozen willing brown trout out of a room sized area in short order. Me? 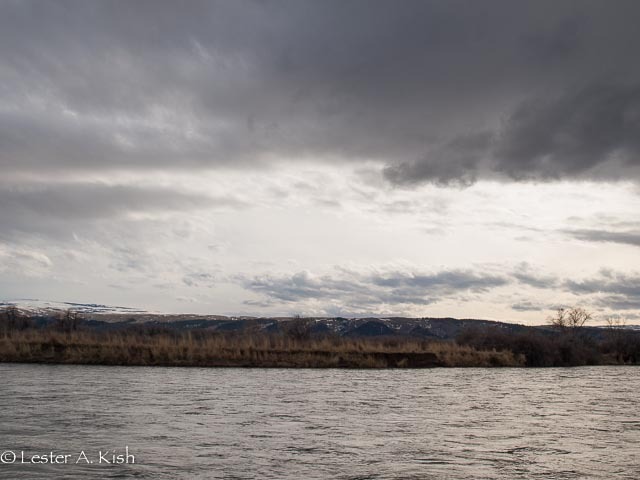 I was done for the day and was content to snap photos and dry fly fish vicariously. We were both happy with the ending. Bill, it was more than an all day trip after the driving is factored in. Floating wise, we were on the water for seven hours or so. That was plenty. I had some tippet rings laying around and decided to give one a try. Making adjustments to droppers is easier, and the leader length stays the same. It worked ok. 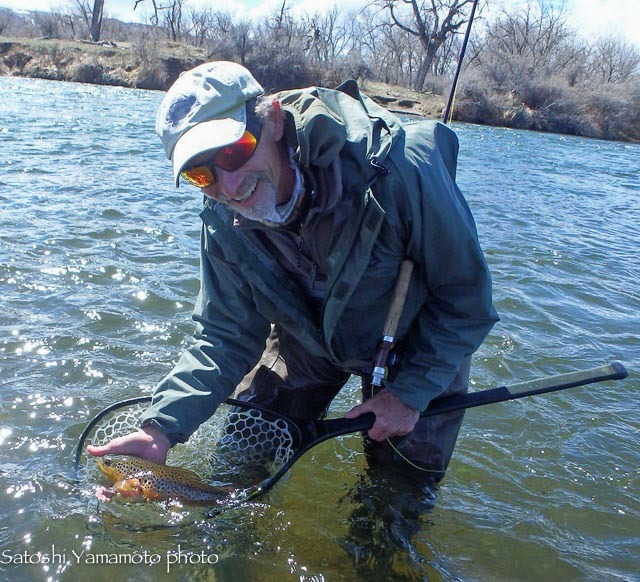 The tippet rings may come in handy for dry fly fishing. I plan to tinker with them a bit this summer. Thanks for reading along. I used to fish it in the 80's and early 90's. Had some glory dry fly days with great hatches and tolerable "company." It's off my radar now, and a bit off my normal path too. High flows and water management detrimental to the trout have diminished it, so I'm told by those in the know. I still fish it once in a while way up river in Wyoming (Thermopolis, Wind River Canyon). I check in on Satoshi's site from time to time, and see him on Depuy's some years. He's got some bugs too! Fancier than mine. Bet they work good. Glad you at least got out. Hi Jim, I wondered if the 'horn had been part of your fishing trapline. It's out there a ways but worth experiencing. It would be interesting to see under more favorable conditions, that being warmer weather, lower water, and of course, more bugs. I can see how one would not go wanting for company, given the limited access. But, that's the way it is most places nowadays. And, like you said, it was good to get away and see some new water. 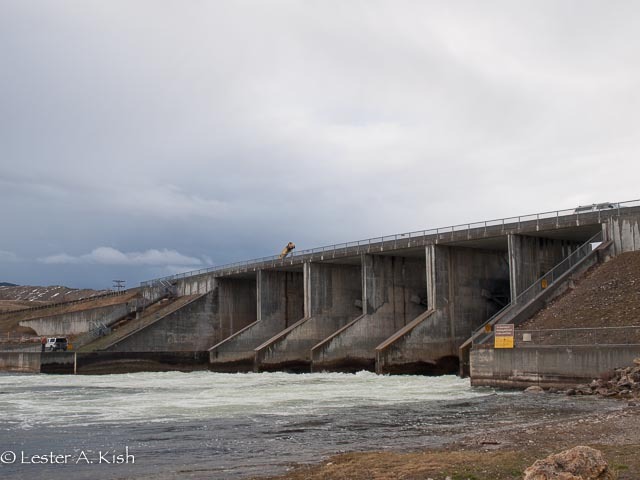 Les: Never fished the Bighorn. Read a lot about it. Always wanted to go. Read that walk/wade access not great...far for me...so hit the Mo instead. New water, however, is always exciting. It would be interesting to see how it fishes in lower water. Nice post. Bob, it was a first for me too. I agree that it would be interesting to see under lower more buggy water conditions. I imagine that it fishes pretty well even after the fish have been "worked over". The MO is a more road trip friendly fishing venue for us both.